Two men have been jailed for a minimum of eight years for killing a cab driver. Grandfather Tony Leigh, 61, was stabbed with a 12ins (30cm) knife during an attempted robbery in east Manchester. His injuries stopped him from receiving cancer treatment and he died months later, Manchester Crown Court heard. 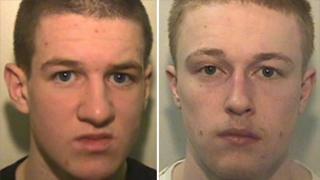 Declan Fitzsimmons, 20, of Wythenshawe and Nathan Livesey, 19, of Newton Heath were given indeterminate sentences after being convicted of manslaughter. Mr Leigh had collected the pair from the Bay Horse Public House in Clayton, Newton Heath, in January 2009. Minutes later they asked him to stop his taxi in nearby Barrington Street and Fitzsimmons pulled out the 12ins (30cm) knife and demanded the keys to the car. The court heard that Mr Leigh had retorted with "you are going to have to kill me first" before running down the street with his keys, but Fitzsimmons chased him and stabbed him. A passerby saw the attack and shouted at Fitzsimmons, who then ran off towards Vale Street. Livesey shouted: "He shouldn't have ripped us off" before fleeing. At hospital, Mr Leigh had to have his spleen and his left kidney removed. Image caption Tony Leigh was an "ordinary hardworking man"
It was later found that he had bowel cancer, he never fully recovered from his injuries and was not well enough to undergo further surgery to remove the cancer. As a result the cancer spread and Mr Leigh died on 2 August 2009. During October's hearing, in which the pair were convicted, Fitzsimmons' legal team had tried to argue the cancer was to blame, but the jury found that the stab wound directly contributed to his death. Livesey had tried to argue he did not know Fitzsimmons was carrying a knife, however he was convicted of the offence after the court heard he had been involved in a previous knife-carrying robbery. Mr Leigh's family described their loved one as an "ordinary hardworking man". "He enjoyed spending time with his family, especially his grandchildren. "This could have been anybody's father, grandfather or friend - an innocent victim of a callous, vicious crime. "We also feel that more security should be implemented for private hire cab drivers to prevent others having to go through the same trauma as us." Fitzsimmons and Livesey were also sentenced for a number of other offences including robberies, burglaries and aggravated vehicle taking, some of which also involved the use of a knife.